The compact was remarkably successful, cutting erosion and runoff on 100 million acres of highly erodible land by an estimated 40 percent nationwide. The policy produced the single most dramatic improvement in farming practices in decades. But 30 years later, the conservation compact is in trouble. And so is drinking water in farm country. 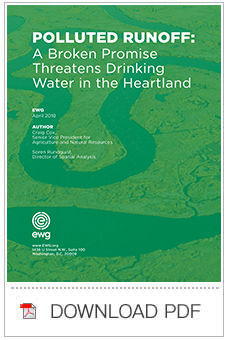 An EWG investigation using satellite imagery finds that in four Midwestern states, excessive – but preventable – erosion and runoff is prevalent on highly erodible land covered by the compact, as well as on cropland not covered by the compact. 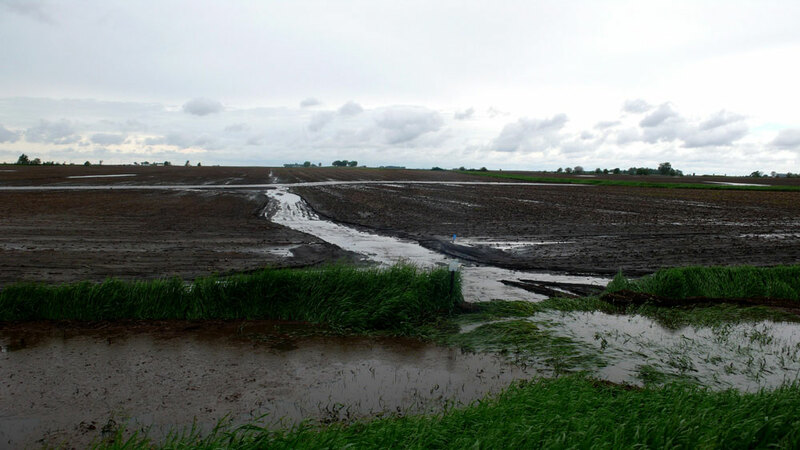 A strong indication of erosion and polluted runoff is the presence of seasonal gullies – natural pipelines that allow fertilizer, manure, sediment and other farm pollutants to drain into waterways and ditches that feed drinking water sources. These seasonal gullies are called ephemeral because farmers use tillage or other equipment to fill them in after harvest every year. The gullies deliver phosphorus – and organic matter like manure, mud and crop residues – into streams and lakes. Phosphorous from fertilizer and manure trigger blooms of algae, which multiply the amount of organic matter in the stream. Utilities must disinfect such water with chlorine or other chemicals. But disinfectants react with algae and other organic matter in the water to produce chemicals with long-term health hazards – disinfection byproducts called trihalomethanes, or TTHMs. Image 1: Gullies are pollution pipelines, sending farm chemicals and manure to streams. Image 2: Planting grass strips, called grassed waterways, heals and prevents gullies. Drinking tap water contaminated with TTHMs increases the risk of developing bladder cancer in humans. In animal studies, TTHMs are also associated with liver, kidney and intestinal tumors. Studies suggest that TTHMs increase the risk of problems during pregnancy, as well, including miscarriage, cardiovascular defects, neural tube defects and low birth weight. EWG’s analysis of tap water testing data found that water supplies in 1,647 small communities, serving 4.4 million people in farm country, are contaminated with TTHMs in amounts at least 75 times higher than California’s one-in-a-million cancer risk level. Between 2014 and 2015, 411 of those communities had TTHMs at or above the Environmental Protection Agency’s legal limit. It doesn’t have to be this way. Erosion and runoff into ephemeral gullies can be reduced or prevented by planting grass strips to protect the drainage pathways that can form gullies after heavy rains. But on the approximately 136,000 acres of highly erodible cropland we examined, more than 60 percent of the drainage pathways were left unprotected from polluted runoff. Fully 80 percent of the pathways were unprotected on cropland not covered by the compact. Enacting a stronger and more rigorously implemented conservation compact when the federal farm bill is reauthorized in 2018 would be an important step toward clean and safe drinking water. Our investigation mimicked the process that the Department of Agriculture’s Natural Resources Conservation Service, or NCRS, uses to assess a sample of highly erodible land tracts each spring to determine compliance with required conservation practices. Availability of high-resolution aerial imagery and data from a remote sensing method called light detection and ranging, or LIDAR. Fields cut by gullies one year can appear to be free of gullies the next year if storms aren’t as frequent or heavy. Therefore, we focused on watersheds that got enough rain in 2014 or 2015 to cause ephemeral gullies to form – more than 3.5 inches of rain in June and more than 13 inches between June and August. Finally, we selected watersheds with National Agriculture Imagery Program, or NAIP, imagery from between late June and September to ensure that ephemeral gully erosion would be visible during the planting and growing season. We used 2015 NAIP imagery for all states except Indiana, where 2014 imagery was the latest available. Overall, we evaluated 136,639 acres of highly erodible land in 19 small watersheds in the four states (see Table 1 below). We sampled just less than 1 percent of all highly erodible land in the four states. NRCS samples about 1 percent of highly erodible land tracts each year. Table 1: EWG investigated 136,639 acres of highly erodible land. We studied over 1,000 miles of flow paths – the drainage pathways on fields where ephemeral gullies form after rain. We checked 537 miles in Iowa, 251 miles in Illinois, 215 miles in Indiana and 75 miles in Minnesota to determine if conservation practices were in place to prevent gully erosion and to determine if gullies had in fact occurred on unprotected drainage pathways. We found that 63 percent of the drainage pathways on cultivated highly erodible fields were left unprotected. 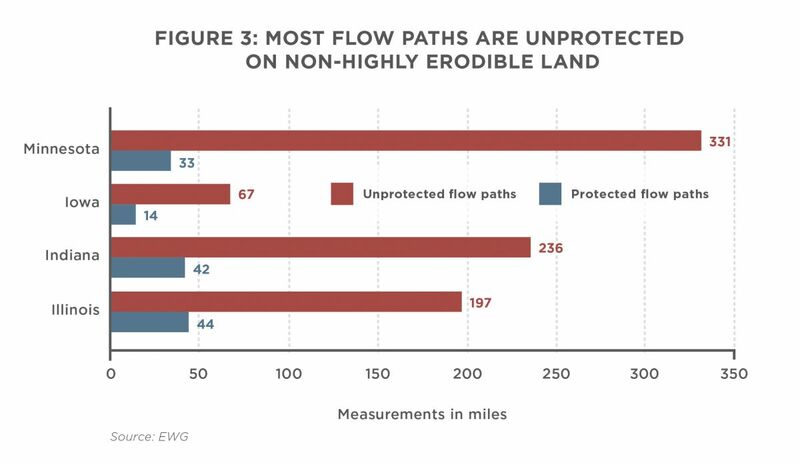 The percentage of flow paths that were protected ranged from 45 percent in Illinois to only 18 percent in Minnesota (see Figure 1 below). Gully erosion was common on unprotected flow paths. Excessive erosion had occurred on 42 percent of the unprotected flow paths. 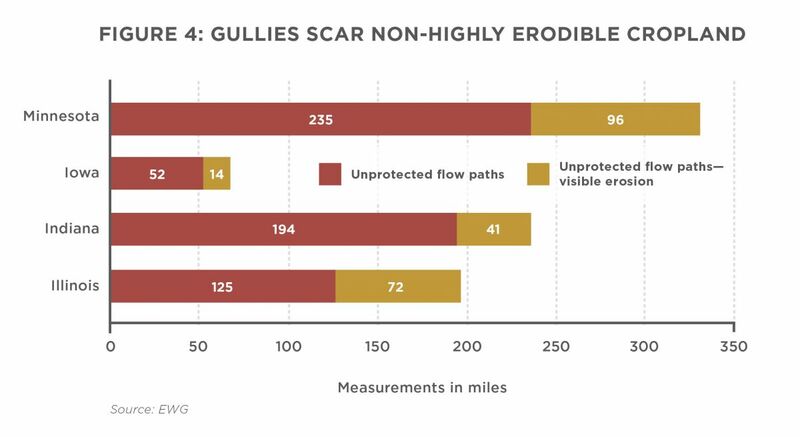 In Illinois, 63 percent of unprotected flow paths were scarred by gullies, as well as 44 percent in Minnesota, 37 percent in Iowa and 31 percent in Indiana (see Figure 2 below). The prevalence of ephemeral gullies on highly erodible land is troubling. Ephemeral gully erosion is a clear sign that the approved conservation plan is either not being fully applied or that the required practices are inadequate. Gullies are by far the most damaging form of erosion and polluted runoff from cropland. But the fact that many unprotected flow lines on highly erodible land were not marred by ephemeral gullies does not mean there’s no problem. The data we used to ensure rain had fallen in the watershed cover relatively large areas, not individual fields. It is highly likely that many fields just didn’t receive enough rainfall to cut ephemeral gullies, even on unprotected flow lines. The imagery available to us to look for gullies may also have been taken before a storm hit a particular field. Moreover, we were looking at a one-year snapshot. Unprotected flow paths that escaped gully erosion in the year we examined could easily produce gullies the next year if a storm hit that particular field. The Natural Resources Conservation Service (NRCS) has not supplied its State offices with guidance for effective gully erosion control, and has not reviewed State-level guidance to evaluate their sufficiency. NRCS relies on State and local offices to facilitate compliance reviews of tracts subject to Highly Erodible Land (HEL) conservation provisions in the Food Security Act of 1985. However, these offices developed inadequate guidance for reviews and for evaluating and correcting gully erosion. Conflicting guidance caused inconsistent compliance determinations, and unclear national policy caused incorrect interpretation of compliance rules. 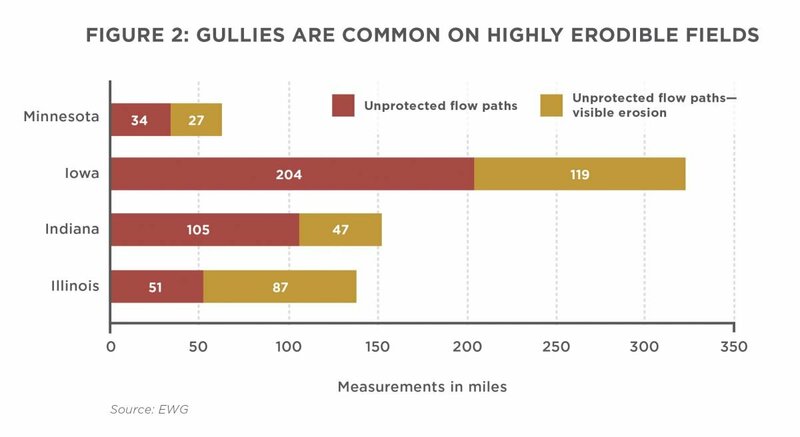 As a result, producers do not know the level of treatment required for controlling all types of gully erosion and could receive inconsistent compliance evaluations. 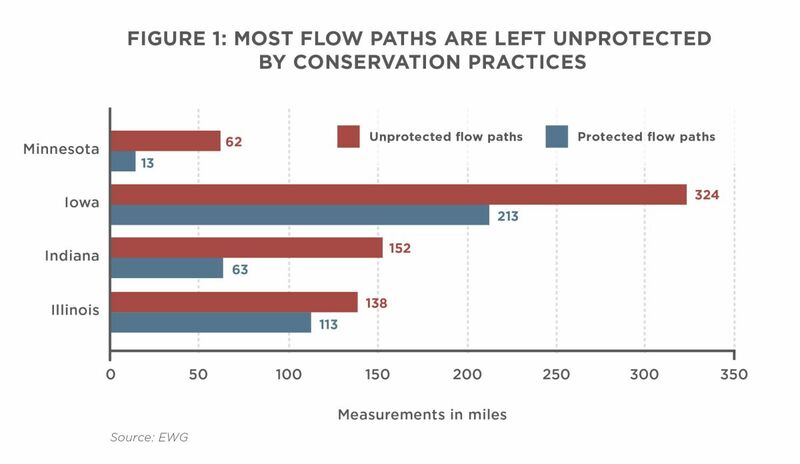 Even more troubling, we found that protection of flow paths varied from year to year between 2003 and 2015, even though the conservation compact should ensure adequate conservation practices are in place every year. Conservation practices disappeared on 103 miles of flow paths over the period, adding to the 573 miles of flow paths that were unprotected every year. Conservation practices appeared sometime during the period on 179 miles of previously unprotected flow paths, but unprotected flow paths exceeded protected paths in each state. Ephemeral gully erosion creates a direct pipeline of sediment, fertilizers, manure and other farm chemicals to streams and rivers. Stronger enforcement of current conservation requirements and making sure conservation plans are meeting current standards would markedly reduce polluted runoff. It is clear the conservation compact’s quid pro quo will not broadly improve water quality unless conservation measures are required on all cropland, not just highly erodible fields. Fields that are not highly erodible are still very vulnerable to ephemeral gully erosion. Less steep but longer flow paths on crop fields give water more time to cut gullies. Moreover, three-fourths of the cropland in the U.S. – 250 million acres – is not classified as highly erodible and is not subject to the conservation compact. Runoff and erosion from these acres is a far greater threat to water quality. We evaluated over 100,000 acres of non-highly erodible cropland in the same 19 watersheds in which we studied the highly erodible fields. We checked 964 miles of flow paths on these acres – 364 miles in Minnesota, 278 miles in Indiana, 241 miles in Illinois and 81 miles in Iowa. We found that 86 percent of the flow paths on cultivated non-highly erodible fields were left unprotected. The percent of flow lines that were protected ranged from 9 percent in Minnesota to 18 percent in Iowa and Illinois. We found 331 miles of unprotected fIow paths in Minnesota, 236 in Indiana, 197 in Illinois and 67 in Iowa (see Figure 3 below). Many of the unprotected flow paths were scarred by ephemeral gullies or showed other signs of excessive erosion (see Figure 4 below). In Illinois, 36 percent of unprotected flow lines were cut with gullies, 29 percent in Minnesota, 22 percent in Iowa and 18 percent in Indiana. Again, ephemeral gully erosion is an episodic event, driven by rainfall. Many of the unprotected flow paths that weren’t gullied when we looked could easily be gullied in a different year when rain fell at the right time and in the right amount. Healing or preventing ephemeral gully erosion on all cropland owned or operated by farm operators who benefit from crop and insurance subsidies would make a major contribution to water quality. 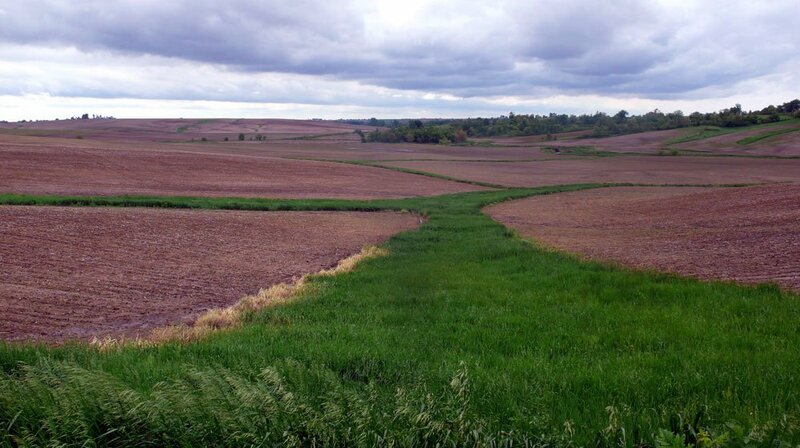 Stronger conservation compliance provisions, coupled with better enforcement, would be an effective way to cut polluted runoff from millions of acres of cropland. The 1985 conservation compact sparked dramatic progress in cutting runoff from the most vulnerable cropland. But our investigation shows that implementation of the compact is falling short. Far too much erosion and runoff is occurring on cropland subject to the conservation requirements farmers promised to meet in return for generous farm subsidies. The USDA must immediately increase the acres it checks every year for compliance with the promised conservation practices. And the department must meet its responsibility to ensure corrective action is taken to either get those practices are in place or stop the flow of subsidies to noncompliant operations. Taxpayers shouldn’t be asked to subsidize farms that are polluting the water they drink, and fouling the streams, rivers and lakes they want to enjoy. As the farm bill is reauthorized in 2018, Congress must do far more. It’s more than fair to expect farmers and landowners to expand their efforts to protect the environment in return for the generous farm and insurance subsidies they receive – $14.5 billion in 2016 alone, according to the Congressional Budget Office. The CBO projects those subsidies will cost taxpayers another $64.3 billion over the next five years. Most of that goes to large farming operations and households making more than $250,000 a year – a far cry from the struggling family farms taxpayers are told they are helping. Congress should enact a renewed and stronger conservation compact between farmers and taxpayers that, at a minimum, requires farmers and landowners to prevent or heal ephemeral gully erosion on all annually planted cropland in order to remain eligible for farm program benefits and crop insurance premium subsidies. The new compact should also ask landowners to establish and maintain a minimum of 50 feet of perennial vegetation between annually planted cropland and intermittent or perennial waterways to filter out pollutants. As our investigation shows, a stronger conservation compact is only as good as its implementation. Congress must also provide annual funding for technical assistance, conducting status reviews and completing other tasks required to fully implement the new compact. This annual amount should be equal to 0.02 percent of the funding otherwise provided through farm program and crop insurance premium subsidies, not to exceed $300 million. Congress must also mandate annual reviews of compliance status on no less than 5 percent of the tracts subject to the compact. A new and stronger conservation compact will create a fairer deal for taxpayers, a level playing field for conservation-minded farmers, and the foundation on which a more effective conservation title can be built. 1 Watersheds classified by the U.S. Geological Survey as Hydrologic Unit Code 12.